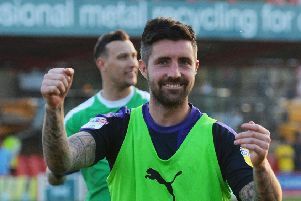 The 28-year-old scored six goals in five games, including a hat-trick in the 4-0 win over Peterborough, as the Hatters climbed to the top of the table for the first time this season. On receiving the trophy, Collins said: “This is the first time I’ve won an award like this. “I’ve been nominated a few times, so I’m delighted to finally get my name on one. “We’ve had a great month, remaining unbeaten, and that always helps when you’re going into games because you’re full of confidence. “The other lads get as much credit as I do for this award, and Mick Harford, who fully deserved his nomination for manager of the month. “What Mick does is he just fills you with confidence. He just tells you how good you are, how well you’re playing and he just keeps things simple. That’s what I like. “I know what I need to do out on the pitch and if Mick’s supporting me and right behind me, then that just gives me a license to go out there and do what I’m best at. “January always seems to be a good month for me for some reason, I don’t know what it is. "I always try to make sure I do things right over Christmas and the New Year, as it’s a big period in the season, and that seems to pay off later in the month as well. “We’ve made a great start to the year, but the main thing is that we keep winning games. With Collins now on 18 for the season, interim boss Harford commented: “James has been on fire. "He’s deservedly in my opinion won the award, not just on goals scored, on his work-rate, his effort and he’ll be the first to tell you, he’ll commend his team-mates for the assists they’ve laid on for him. “Overall he’s deserved it, he’s worked hard and I’m really pleased for him. “He’s work-rate is phenomenal, he gets round the pitch, he closes people down. “We put him in a position where he’s very good at defensive corners, in that little hole we put him. Team-mate James Justin was also thrilled to see the striker win, saying: “Collo’s been unreal, he just seems to be in the right place at the right time, just doing what a good striker does. Sky Sports’ EFL pundit Don Goodman said: “It couldn’t have been a more turbulent start to the month for Luton, but thanks in no small part to Collins’ goals, they shrugged off Nathan Jones’ departure and rose to the top of League One.